Put on this classy but yet sophisticated 14K Yellow Gold hollow Miami Cuban Curb Chain Neckalce. This 7.5mm wide gold necklace is complete with a dazzling high polish finish which is sure to catch the eye of anyone who can appreciate it's beautiful design and work. The chain secures with a lobster claw clasp and comes in a variety of lenghts. 7.5MM Wide Real 14K Yellow Gold. 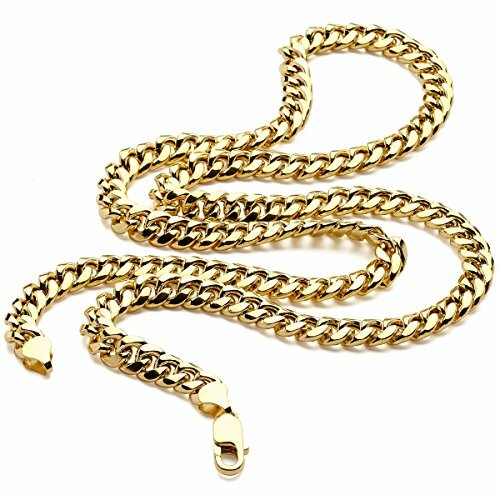 MADE IN ITALY Miami Cuban Chain Necklace (Stamped 14K ITALY)- Available in 8.5",22", 24", 26",28" & 30"
THIS IS THE REAL DEAL!! Unlike our competitors we do not sell Gold Plated Bras or Base Metal Chains. If you have any questions about this product by Metal Masters Co., contact us by completing and submitting the form below. If you are looking for a specif part number, please include it with your message.